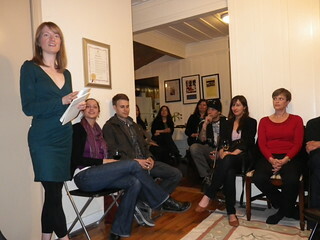 Deborah Willis hosted her final reading at Historic Joy Kogawa House where she has been writer-in-residence since January. John Asfour, our first writer-in-residence, was a surprise guest, as he is in town from Montreal for book launches of his new work Blindfold. Deborah Willis read a new short story that she had written while at Kogawa House. The final event at the house was attended by friends, students and members of Kogawa House Society. Prior to the reading, we had a dinner with members of the Historic Joy Kogawa House Society Board. We were joined by Tamsin Baker, Vancouver area manager for The Land Conservancy of BC – owners of Kogawa House. Author John Asfour was a surprise guest. 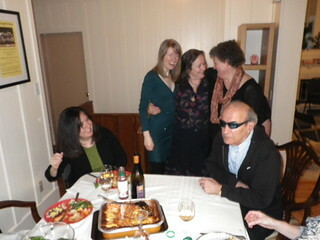 left to right in the photo is Tamsin, Deborah, Christine, Ann-Marie Metten and John Asfour. This entry was posted in 2007 Gung Haggis Fat Choy Dinner, Joy Kogawa & Kogawa House, Literary Events, Uncategorized on April 16, 2012 by admin. We had a wonderful practice tonight…. Paddlers said it was one of the best. The sun was out… the wind was up, whitecaps in False Creek – YIKES! practice. But it was a great practice. 20 paddlers in a Gemini boat. We started with a warm-up paddle to Cambie St. Bridge. We did a 500m race piece to prepare for the May 19th Bill Alley memorial dragon boat regatta organized by the Lotus Sports Club. After the race pieces we looked at correcting things that needed improving such as our timing, and technique. We did some speed drills, some small group work, then worked on our starts. We have a good dedicated core crew who come every practice on Tuesday 6pm, and Sunday 1pm. Some of the paddlers have been with us 3 years. Our drummer/steers will have her 5th year with us. Ex-paddlers still come to race with us. It's good to have friends. have a Tuesday Night Food Club after practice. Each week we try to go to a different restaurant. Usually we go out for Chinese food… we like Foo's Ho Ho and Hon's Won Ton House in Chinatown… Sometimes we go to Congee House on Broadway and Main St. 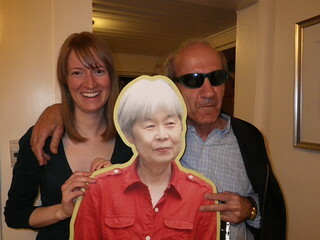 But tonight we went the The Clubhouse Japanese restaurant, and were promptly greeted by the manager Karen. She remembered us from last year and welcomed us back. Join the Gung Haggis Fat Choy dragon boat food and social club. This entry was posted in 2007 Gung Haggis Fat Choy Dinner, Main Page on May 9, 2007 by Todd. Suzanne Anton, and former councillor Ellen Woodsworth. dragon boat paddling and was a very enthusiastic novice. of Vancouver's most wonderful multi-cultural celebrations. pop belted out by Leora Cashe, classic bagpipe and Chinese pop classics. the appreciations, people proved themselves to be in good humour. one of Vancouver’s greatest strengths—our multi-culturalism. life of our city, it is a key strength in our economic development. reasonably demanding and always in good humour. This entry was posted in 2007 Gung Haggis Fat Choy Dinner, Main Page on February 8, 2007 by Todd. Gung Haggis Fat Choy 2007 Dinner – Awesome… Really Awesome! mini-kilt were over the top! You've been properly Gung Haggisized! Thank you Heather Pawsey… you astound us everytime! Thank you Kathryn… you jumped right in with your beautiful flute for your first Gung Haggis experience. Thank you Lensey Namioka! Your reading of Half and Half described our food, and was a hoot! Thank you Margaret Gallagher! You embrace Gung Haggis Hapa-ness! and project it so well! Thank you Ian Mason- our resident Burns expert, you brought in Eco-Burns – WOW! knowledge, your bass and your harmonica. Thank you Charlie Cho, you kept us on track and we were s-m-o-o-t-h! Thank you Carl Schmidt, you made us sound great, looked after us on stage! WOW! their prizes. You are truly special. for reading a Chinese poem and giving a warm Vancouver welcome. sum, and providing a wonderful venue for our event. This entry was posted in 2007 Gung Haggis Fat Choy Dinner, Gung Haggis Fat Choy dinner, Main Page on January 29, 2007 by Todd. Tickets for Gung Haggis Fat Choy on the weekend. There are limited tickets available at the door. Tickets must be picked up between 5:00 pm and 6:00pm or they will be released back for sale. This entry was posted in 2007 Gung Haggis Fat Choy Dinner, Gung Haggis Fat Choy dinner, Main Page on January 27, 2007 by Todd. We thank our prize sponsors for their wonderful donations that support our event. Highland Games featured human curling and dragon cart races. “Toddish McWong” at this time of year. This entry was posted in 2007 Gung Haggis Fat Choy Dinner, Main Page on January 26, 2007 by Todd. “Much better than 100 years ago,” I informed him. wrongfully accused but later aquitted. “Today, Chinese and Scots have gotten over their differences, getting married and having Scottish-Chinese-Canadian babies. “Is this kind of gimicky?” Chan challenged me. Today, January 25th is Robbie Burns Day. Cart racing and awards at 2:30pm. pod cast interview with “Guts McTavish” the Scottish puppet with big white eyebrows. This entry was posted in 2007 Gung Haggis Fat Choy Dinner, Main Page on January 25, 2007 by Todd. Today, I spotted the tv interview with Erin Cebula for Global TV's Global Village. Earlier this week, I heard from friends that they had seen it. Great spot! Erin edited in some still pictures of our Gung Haggis Fat Choy performers such as Qiu Xi He of Silk Road Music, and Joe McDonald, bagpiper, cutting up the haggis. They even showed a picture of me with then mayor, Larry Campbell, both wearing kilts and clashing chinese jackets. There was also a sequence with Fiona Tinwei Lam reading her poetry, at the Gung Haggis Fat Choy World Poetry Night on January 15th, Monday, at the Vancouver Public Library Central Branch. And I picked up a copy of The Source/ La Source, a bilingual newspaper, with an interview and picture of me. find theirs for ten years with his Gung Haggis Fat Choy combination Robbie Burns Day and Chinese New Year celebration. and music to brighten the spirits at this dark time of the year. Wow…. spreading the word and philosophy of Robbie Burns… in English, in French and Chinese! This entry was posted in 2007 Gung Haggis Fat Choy Dinner, Gung Haggis Fat Choy dinner, Main Page on January 25, 2007 by Todd. Sandhills creator and winemaker Howard Soon, “and only 14 Gold out of a total of about 800 wines entered around the world”. McWong's Robbie Burns Chinese New Year Dinner. production featuring First Nations heritage and culture. were disappointed in the wine selection at the restaurant. girlfriend and I like nice BC wines. outside Vernon BC, at Silver Star Mountain Resort in August 2003.
a nice chat, and I shared with him that I had been working with explorAsian Festival and I thought he should be listed in the Asian North America Timeline Project.